I’d originally planned to do a bit on each of the four seasons – hey, four topics! – but there ended up being enough other stuff that I’m lumping them all here. So here goes: Summer, Winter, Fall and Spring. The bike is the king of summer. EVERYONE rides during the summer – kids on vacation, heading to the pool or each other’s houses, ma and pa playing hookey from work, bullets, ducks, and cruisers. The roads are fast – no more sand in the gutters, the days are long – ride before and after work, and the air is warm – pack the water bottle, and ice down the post ride beverages. Summer is the Tour – sneaking peaks at the office to see who’s on the break in the morning, and a lunch hour filled with sprints, climbs, and jerseys. Summer is without excuses – the bike is back from winter tune-up, there’s no special clothing, and there’s no need to rush home before dark. Summer is never having to fix a flat alone – someone is bound to come along and offer aid. Summer is one more loop, one more climb, one more stop at the Circle K to refill, and one more 4AM to make the weekday morning ride. Summer is other riders – more bodies in the group, more flyers off the front before the town line, and always another rider up the hill to try and catch. Summer is skinned knees, grassy hills, and wobbly kids without training wheels. Summer is ramps – dirt, wood and cinderblocks, or plywood on a lawn chair to launch into the lake. Wheelies and trackstands. Bike racks and patios. Waves and “Hey, Lance Armstrong!” from the passing car. Winter is lonely. Rollers. DVDs. Maps. Basements. Fluorescent lights, degreaser, and skinned knuckles. Winter is cold. Lights and half-charged batteries. Snot-cicles. Mufflers, tights, and burning cheeks. Sanded streets. Phone calls with fingers too numb to pry a tire off a rim. Winter is planning. Training. Races. Gear. Sales. Stopping in the bike shop just to see someone else’s bike. Fall is the afterglow. Falling asleep in a lover’s arms, the days grow short, the sweaters come out, and the cyclists bask in the form from a hard fought summer. Long rides to fill out mileage goals. Rides cut short by long shadows and short days. Fall means rides stop at the coffee shop more often than not – warm java to take the edge off the chill. Saturday morning delayed an hour to wait out the frost. Singletrack is sweeter in the fall – poached in an orange vest with a card in the spokes to scare the heck out of hunters. Bookbags, bike racks, and crossing guards. Fall is perfect in every way, right up until the roads get sanded. Spring is hope. Spring is excitement. Spring is embarrassment at a winter’s indulgence writ in bulging lycra for the world to see. There’s the joyous ride after the first hard rain pushes most of the sand into the gutter. The ride, replete with snot rockets, tearing eyes, and numb fingers, racing ahead of the snow before the late season storm brings the sand back. First flowers. First ride watching another rider pass the other way after trading the “wave”. Spring is penance and redemption all at once. Legs filling with lactate after a winter of ease. Lungs bursting with effort, and fighting off pollen. Begging the mechanic to finish the overhaul by Friday, and “Yes, I should have brought it in in January.” (Though, hopefully this is offset by “but I managed to sneak in 100 miles that month”). And the reward of longer days, lowering heart rates, shrinking waists, increasing speeds. Cheeze? Sure. If I had to pick a favorite time to ride, it’d be fall. Perfect weather, good form, and a sense of desperation as the air looms heavy with snow. But just knowing I rode in winter redeems any other faults the rides may have, spring is a no-brainer, and summer is paid back in full with sweat, tan lines, and trips to the beach. 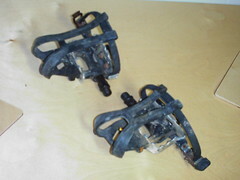 I’ll admit – I don’t use ’em any more – I’ve picked up a pair of SPD shoes and pedals for the mountain bike/trailer dragger, and I’ve got a slick pair of look knock-offs and nice adidas shoes for the road bike (though if anyone out there wants a thorough review of the new SPD-SL pedals, I’d be happy to oblige given a test set). Much like the frame, they’re a perfect marriage of form and function. They hold tasty beverages, they keep out grit, and they let riders drink without spilling. I’ll admit, my first waterbottles were treasured for their ability to let me sneak rum and whatever into venues that wouldn’t sell booze to me for the silly reason that I was too young. But as I started biking, I gained a new appreciation. Filling the bottles is as important as filling the tires with air before a ride. Then there’s the subtle joy in learning to put the bottles into the cages without breaking cadence, and finally the zen that comes with learning to drink out of the side of one’s mouth, staying nice and aero, and not obscuring one’s view. But the ritual is the best. Find a new shop? Buy a bottle. Take a trip? A bottle’s a great souvenir. Form follows function. As the bicycle frame represents a finely honed trade between strength and weight, between stability and maneuverability, the bottle cage represents a compromise between strength and weight, between accessibility of beverage and safety of beverage. 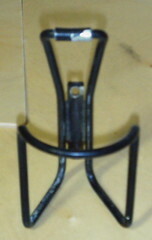 I’ve tried fancy bottles, holders, and combinations of both, and I keep coming back to the classic bent wire bottle cage. 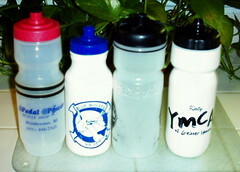 Works with a wide range of containers, from actual water bottles to 20 ounce soda bottles out of the grocer’s cooler. In a pinch, you can roll up a shirt and a change of pants into a nice, tight cylinder and be set up to be seen in public. But, sometimes, the option in place just works. When that happens, it’s time to jump on the bandwagon that works and ride it until the wheels fall off. Yeah, I’ll admit – I don’t run them on my road bike. Why? ‘Cause it’d look like a fred. Not the kind you breathe, but the kind beneath your tires. Notice there are some items (clipless pedals, shorts) left off out of spite, and others (Seats, seatposts, stems) left out because, frankly, they bore me. Wow. What a big word. Are there heroes in the postmodern day? Have we managed to deconstruct, transcend (Remind me to tell the PHC Joke at the end, as Footnote 1), analyze, manage, and debate the Hero off of his place in the public square? Cycling has heroes in droves. Pick an arechetype, there’s a cyclist to fit the mould. We’ll start with the obvious, the guy about whom we have another 10 days of coverage. Big Tex. Even at the beginning of his career, Lance Armstrong was a force. US Professional Champion. World Champion. Stage Winner. Classics Winner. Even before 1996, Armstrong was carrying the American torch in the European cycling world. And his return to the peleton, and into history, is rightly the stuff of legend.